I have previously written about our Science Fiction Naval games using Star Navy 5150, by Mack Harrison and Ed Teixteira. My particular interest in these rules was their simplified but effective campaign system. This series of posts will discuss adapting this system for use with the Galactic Knights, published by Monday Knight Productions. The Star Navy system could of course be easily adapted for use with other tactical rules, the adaptations needed being somewhat dependent upon the individual rules themselves. If you don't already own a copy of Star Navy 5150, I'd highly recommend purchasing one, either as a pdf or hard copy; $17 or $20 respectively. Some of what I say in this and future posts may not be fully comprehensible without a copy. Galactic Knights was written by Dan Davidson, and first published by Monday Knight Productions in 2005. 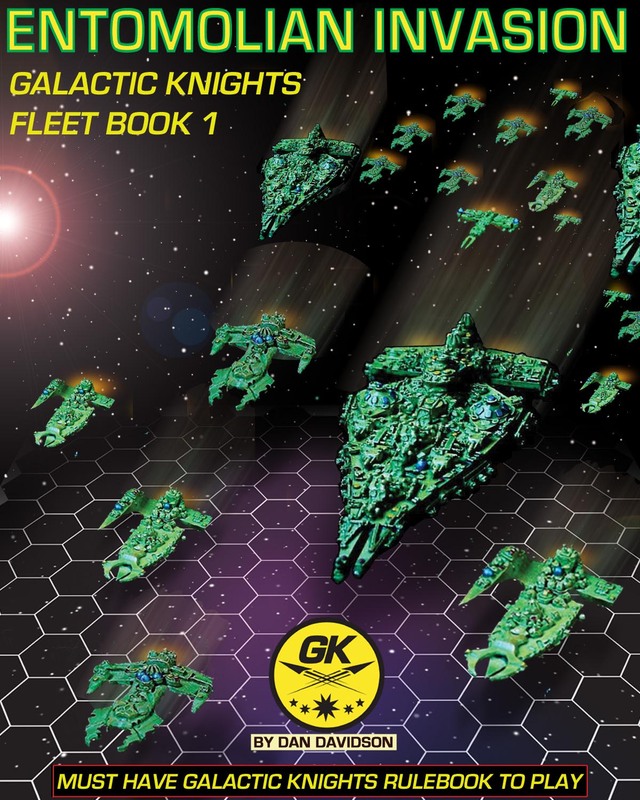 The initial rule book covered the Terran and Avarian fleets, using the excellent Galactic Knights miniature ships (formerly Superior Starfleet Wars). Entomolians (I prefer the original Superior spelling, Entomalian) were added in Fleet Book 1, Entomolian Invasion, also by Dan Davidson (2006), Carnivorans in Fleet Book 2, Carnivoran Republic Star Forces (2008) by William Thompson, and most recently Fleet Book 3, Aquarian Alliance Stellar Forces by William Thompson (2013). I have previously described games with the GK rules, which are quite tactically interesting without being overly complex. Those rules lack much guidance for setting up battles, something which Star Navy 5150 handles well. This first post concerns adapting that system for use for use with Galactic knights, whether campaign related or just one off battles. Star Navy 5150 uses the long range scanning capability of the various factions, plus whether the faction is controlling or contesting the system in question to determine the orientation and initial distance separating the forces. This clever idea helps ad some spice to the actions, and this will be even more the case using Galactic Knights for tactical combat, due to the more varied weapons systems, the influence of shield and weapon orientations, and ship designs. As Galactic Knights already uses the number Sensor systems for Initiative, it makes sense to adapt the Star Navy system to use the comparative number of Sensor systems in each Fleet in much the same fashion. 1) Add up the number of Sensor systems in each fleet (including the sensors on any Controlling Space Station(s), if present). This is the done in the same way as for determining Initiative under the original GK rules. (The first supplement revised it to using 2 D6 modified in the same fashion but without a limit on the degree of sensor advantage - this wouldn't work as well for our purposes here). 3) Add 1 to the total if the Fleet in question is Aquarian, Subtract 1 if the Fleet is Entomalian. 4) Find the difference between the final results for each fleet. Controlling ships are the attackers. Controlling ships contact the contesting ships at 90 degrees to the front of the contesting ships. Controlling ships count as automatically winning the Initiative for the first turn! Contesting ships are the attackers. Contesting ships contact the controlling ships at 180 degrees to the rear of the controlling ships! Controlling ships contact the contesting ships head on. Place an asteroid field on the table! Contesting ships contact the controlling ships at 90 to the front of the controlling ships. Contesting ships contact the controlling ships head on. Contesting ships contact the controlling ships at 45 degrees to the front of the controlling ships. If an asteroid field is called for, it will have a number of asteroids equal to the raw Long Range Scan die score of the Fleet contesting the planet. Each side will then roll a D10, using the scores on the grid below to determine the center of the field. The Controlling Fleet's score determines the right to left axis, and the Contesting Fleet's score determines the up and down axis, with "10" being farthest from the planet. The defending Fleet places one asteroid at that location, with the remainder of the asteroids placed 6" from the central one in a symmetrical fashion; in the event of dispute that can't be resolved by the players, the controlling players choice stands. In the example, the controlling player rolled "7" and the contesting player rolled "5". The central asteroid is placed on the grid at (7,5) - the dark orange square. In this case, the earlier Long Range Scan die score by the Contesting player was also a "5", so there are 4 more asteroids to place. A possible placement pattern is indicated by the four light orange squares. 1) The Defending ships (usually, but not always, those of the fleet Controlling the planet) will be set up no more than 12" from one short edge of the table. One might choose to place a Planet marker or an arc of a planet's surface along part of this edge as a visual reminder. The first ship placed by the Defender determines the maximum distance from the Defender's edge that their ships may be placed. 3) The Defender then places a number of ships on the table equal to the modified Long Range Scan score of the Attacker (this includes the first ship placed). 4) The Attacker then places a number of ships on the table equal to the modified Long Range Scan score of the Defender. 5) Alternate steps 3) and 4) until one Fleet has placed all of its ships on the table; the other side then places all of its remaining ships on the table, and play begins. 1) The attacker places drift markers directly behind each of his ships; the minimum is 1 hex, the maximum is 1/2 the maneuver points of the ship with the highest Maneuver points in the Fleet. 2) The Defender then paces drift markers for all of his ships. The minimum is zero (same hex as the ship), and the maximum is up to 1/4 of the Maneuver points of the highest ship in their Fleet. "Sir, sensors are detecting multiple Jump Field signatures at 30 clicks, bearing 135, azimuth -45!" "Battle Stations! Power up shields to maximum... "
Prior to the debacle of 1806-1807, there had been a single large (8 squadron) Uhlan regiment in the Prussian army. With the reorganization of the (much downsized) Prussian Army following the Treaty of Tilsit in 1807, these troops formed the nucleus of the two new Uhlan regiments, the 1st and 2nd. Major von Schill's unauthorized and unsuccessful raid in 1809 lead to his regiment, the 2nd Brandenburg Hussars, being disbanded. In its place, a 3rd Uhlan unit, the Brandenburg Uhlans #3 was raised. Five more Uhlan regiments were raised for the 1815 campaign. All the units wore essentially the same uniform, the regiments being distinguished only bu the color of their shoulder straps (and later, their buttons). Although a dark blue Litewka coat was an option for campaign dress, the Uhlans generally wore their "Kollet" jackets, which had red pointed cuffs, collar, and turnbacks, as well as a red stripe of lining showing on the outer edge of the reversible lapels (for parade wear, they were buttoned with the full red lapels showing). A blue and red lancer girdle was worn as well. This colorful unit is the Brandenburg Uhlan Regiment #3, with their yellow over blue lance pennons. The 1st regiment had white over blue pennons, and the second red over blue. In March, 1815, all regiments, including the new raised ones, were supposed to switch to white over black... Boring! The trumpeters of all regiments had red shoulder wings with gold lace, but for some reason did not have the red plumes common to other Prussian musicians in full dress. These lovely castings are Perry figures. As a regimental tradition, the officers of the Brandenburgisches Uhlanen Regiment bore white lances larger pennons than the men, in reversed colors (i.e., blue over yellow instead of yellow over blue), with the blue upper half bearing a yellow son, and the bottom (yellow)half a black Prussian Eagle with the motto "Nec Soli Cedit" below it. This was the motto of Frederick I of Prussia, and translates roughly to "he yields not even to the sun", a reference to the Sun King, Louis XIV, who ruled France from 1638 - 1715. A rather peculiar anachronism. Perhaps it was a way expressing anti-French sentiments without being directly offensive to Napoleon or the Empire? In any event, the custom was abolished in 1812... at least officially. As this is too choice a bit of military "bling" to pass up, and the lancers didn't carry standards, I have depicted the officer with the offending special pennon, but without the white lance... presumably in an attempt to evade censure by the army regulation "police"! If the shako was not worn with its oilskin cover, it had yellow cords and, for full dress, a tall black plume. Only the Leib squadron (which later became the Guard Uhlans) wore a czapska. Standard Prussian cavalry overalls, grey with a red stripe and buttons down the outside seams, were worn. This spare Uhlan officer I have painted up for use as an infantry Brigade commander. Evidently he must be a colonel of a Pomeranian regiment (white collar and cuffs), jumped up to fill a temporary command vacancy. He wears the silver mixed with black sash common to all Prussian officers. The Kongliche Preussusisches Freikorps von Lutzow, usually know as "Lutzow's Frekorps", was raised in February 1813. It included 3 battalions of infantry, each of 4 companies; 1 company of the 3rd battalion were Tyrolean Jagers! There was one battery each of foot and horse artillery, and five squadrons of cavalry, ultimately 2 each of Husars and Uhlans, and one of Mounted Jagers. These figures are part of a large group of old Minifigs that Joe passed along to me a number of years ago when I started my Prussian army with another set of Prussian Minifigs purchased nicely painted (and very unexpectedly) from Jamie W. at Historicon 2003. They underwent modest rehabilitation to form a unit that can at least pass for the cavalry of the Lutzow Freikorps. They look a bit like Brunswicker wannabees, eh? All but the Tyrolean Jager company of the Freikorps wore black coats and pants. The Uhlans had red piping on the collars and cuffs and down the outside seam of the pants. All belts were black, and the Uhlans reportedly wore black leather gauntlets as well! Black over red lance pennons were carried, as seen above. 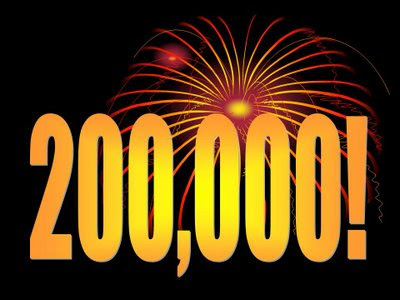 Today "Blunders on the Danube" passed 200,00 page hits. Not bad for having started just a little over 3 years ago. No give-aways, etc, just my thanks to all who have visited, and especially left their comments. We had a break in the cold and snow this weekend, so that meant it was time to follow the Prime Directive, and take advantage of the climactic conditions and prime some lead! So I got out most opf the projects I plan to work on the next few months, trimmed the flash off, glued the figures to tongue depressor and/or assembled models as needed and primed them in the garage - over 120 figures all told! I am out of the office the first week of March - can you tell I have plans? The Egyptians etc are to expand my Egyptian army - aside from the above, there are also 3 more Old Glory Eyptian Chariots to assemble, prime and paint. I'll be running at least one game of "Pulse of Battle" at Historicon using them, to be opposed by Ken Baggaleys Canaanites. I also picked up a nice 6 x 10+ foot piece of tan/heather flannel to use as the ground cloth for the game, and I have a pair of "Ramses II" type statuary to paint for table dressing.